Can you name any of the unidentified players? Black and white negative showing the Brooklin Lacrosse Club Intermediate "A" Champions. Front row: Bev Grooves, Jim Cherry, Levi Arksey, Glen Reazin, Luther Vipond, Gord Cook. 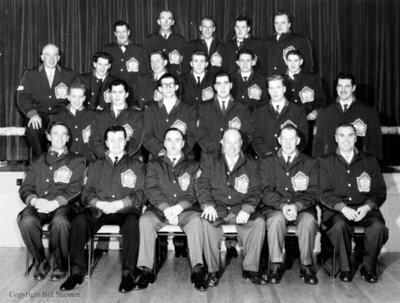 Brooklin Lacrosse Club Intermediate "A" Champions, 1960, Bill Stannett. Whitby Archives A2014_002_031A.